We speak to James Robinson, Wetherspoon Head of Food Development, to find out more about their use of free eggs and company policy on welfare. We speak to Harvester Marketing Manager, Laura Walker, about the restaurant's use of free range egg shells in their meals. We have all seen their slick TV advertising, but we wanted to find out if Aldi’s welfare credentials are all they’re cracked up to be given their low prices. We spoke to Nicki Fisher, Head of Sustainability, about how successful retailing and high welfare can go hand in hand. The feature was published in Issue 7 of Chicken & Egg in Spring 2014. 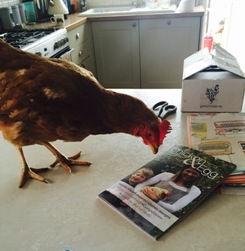 How the Co-op broke a few rules to improve welfare for laying hens. Published in Issue 6 of Chicken & Egg in Autumn/Winter 2013. We put some questions to Nina Prichard, Agricultural Assurance Consultant at McDonalds, to make sure we can enjoy free range Mctreats at any time. The article was published in Issue 5 of Chicken & Egg in Summer 2013. We spoke to Gayle Twigg, British Airways Catering Manager and the article was published in Issue 4 of Chicken & Egg in Spring 2013. 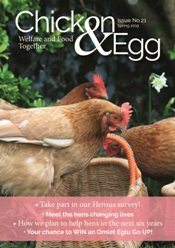 We interviewed Charlotte Williams, Corporate Affairs, at Tesco Head Office to see what they really think about hen welfare. Our exchange was published in Issue 1 of Chicken & Egg in Spring 2012.